MIAMI, FL, April 3, 2019 – On March 31, 2019 Miami-based United American Corp (“UnitedCorp” or the “Company”) (OTC: UAMA) released its financial results for year-end December 31, 2018 and provided a corporate update from management related to its three strategic areas; data centers/ BlockchainDome Heat Stations, fixed and wireless telecommunications, and intellectual property applications and technology related to social media, telecommunications and blockchain technology. UnitedCorp reported positive results for 2018 including revenues of US $1.7 million, consolidated net earnings of $249,693 and consolidated EBITDA of $339,842. Revenues accrued exclusively from its Canadian subsidy, which owns and operates its BlockchainDome Heat Stations and which yielded $446,506 in net profit. BlockchainDome operations began in May 2018 with 1,000 servers going online. The number was increased to 5,000 in 4 BlockchainDome Heat Stations progressively up to November 15th for a total of 8.5 megawatts. Revenues therefore represent a ramp up of operations during that period, with December being the first full month of operations with 5,000 servers online. 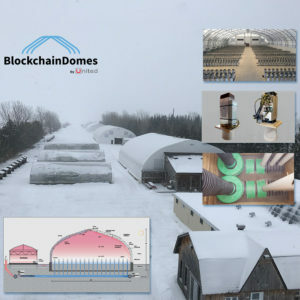 In February 2019 the Company purchased the property where the 4 BlockchainDomes are located, which is not yet reflected as an asset in the current financial statements. 2 Gross profit consists of total BlockchainDome billings less direct costs (mainly electricity) and is a non-IFRS measure. Since the Company bills in advance for services and pays its main direct costs in arrears, gross profit as a percentage of revenue may be higher during the current growth cycle. While the Company will continue to develop its BlockchainDome Heat Station business in 2019 as a primary source of revenue, it will also continue to develop its business in other strategic areas. The Company also intends to re-examine the feasibility of up-listing to the OTCQB board or other exchanges as to be determined. The Company has been refining its proprietary passive cooling ground-coupled heat-exchanger technology developed for its BlockchainDomes to be used for hyperscale data centers. This is in response to the increasing demand for cloud computing, much of which is to support the growth in consumer and corporate applications or “apps”. Such data centers have significant cooling requirements for their servers which are often one of the major cost components of operations. Hyperscale data centers are often located in cooler climates to reduce the cost of server cooling. The company has developed and filed a patent application for an airtight negative pressure server enclosure which, when used in conjunction with its passive cooling ground-coupled heat-exchanger technology, can reduce costs of operations even in environments where typically there is little or no cool ambient air as it does not require mechanical or HVAC-based cooling systems. The Company recently announced that it will complete the acquisition of TNW Wireless Inc. (“TNW Wireless”) from Investel Capital Corporation (Canada) later this April after Canadian Radio-television and Telecommunications Commission (“CRTC”) Decision 2019-56 ruled on February 28, 2019 that Bell Mobility Inc. (“Bell”) and TELUS Corporation (TELUS) were required to provide it with national roaming services as mandated by the CRTC. It has already initiated the interconnection process with Bell and TELUS as well as with Rogers Communications Canada Inc. The acquisition is subject to approval of Industry Science and Economic Development Canada (“ISED”) and the Company has already submitted all necessary information to ISED. TNW Wireless will focus initially on the development of connectivity within its licensed territory along the Alaska Highway, which is currently underserved by other carriers. TNW Wireless has designed self-contained transceiver modules for rapid deployment along the highway. Immediately after ruling on TNW’s application, the CRTC issued a Notice of Consultation, 2019-57 which will form the basis for a new competitive framework for the future of the Canadian wireless industry. TNW intends to submit interventions and appear in person during the CRTC hearings and be an active participant throughout the entire process. The consultation will focus on the possible use of incumbent national wireless networks by smaller licensed wireless carriers such as TNW to allow them to offer national coverage with the goal of increasing competition in the Canadian market. The Company is currently piloting, in partnership with a local Quebec utility, an innovative last mile solution developed in-house to provide wireless broadband connectivity to underserved residential and commercial subscribers. This will provide subscribers with a faster and less expensive option over their current DSL, cable or point to multipoint service. Utilizing the partner’s utility poles, the Company installed its own fibre cable along the pilot service area which services subscribers through wireless access points, therefore without the need for a physical connection. Unlike traditional high speed Internet service, this technological approach is less restrictive with bandwidth use and will permit high density connectivity to each subscriber. Once the pilot is complete later in the 2nd quarter of 2018, the Company will finalize its business plan to roll out the service as a separate operating division and will provide updates as these plans develop. UnitedCorp will continue to defend its position with respect to certain third party telecommunications assets and operations to which it has an interest and which are currently in dispute in a Vancouver proceeding. Recently, some of these assets were released to the third parties. The Company is supporting litigation to retrieve the balance of the assets and operations which will be used to support the Company’s current and future telecommunications operations. The Company has always believed strongly in innovation and the value of developing a portfolio of high quality intellectual property. It currently maintains the rights, through development or acquisition, to a number of intellectual properties and patents pending under its intellectual property portfolio. It intends to continue this strategy and exploit these assets as part of its business plan. This includes BlochainDomes, iFramed social media posting technology, iPCS Smartphone over IP, BlockNum blockchain over PSTN and others. The company will continue its focus on the development of intellectual property and technology solutions such as its Last Mile initiative. It is currently developing several applications for transactions secured on the blockchain which have resulted from experience gained with the BlockchainDomes. It will also continue to pursue any infringement of its intellectual property including current actions against Snap Inc., Facebook and Instagram for infringement on iFramed and will seek appropriate remedies. The Company’s financial statements are available at www.otcmarkets.com under UnitedCorp’s profile.